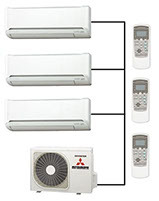 Mitsubishi Ductless Air Conditioning and heat Pump Systems can be used for residential or commercial applications. Common residential uses include climatized garages and storage areas or any room that is best served by its own system. Commercial uses include server rooms, electrical equipment rooms and work or retail areas. Mitsubishi Inverter Drive Heat Pump and Air conditioning systems use variable frequency drive technology to automatically match system operation with the actual cooling demand. 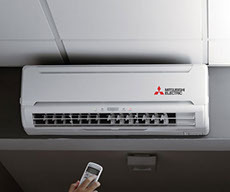 Mitsubishi ductless heat pump and air conditioning systems deliver efficient comfort directly into spaces served without the need for ductwork. are the most common solution for individual spaces. Wall mounted unit deliver quiet cooling to individual spaces efficiently. Some models offer SEER ratings higher than 20+ SEER. Wall mounted unit respond quickly to changes in room heat load and maintain precise temperatures. Relative humidity control is enhanced with automatic low speed operation when moisture removal is the priority. Wall mounted fan coils can be connected to individual outdoor condensing units or combined together operating from a single outdoor unit. Wall mounted fan coils are the least expensive option for the indoor section of the ductless system. can be used in some or all rooms served. They can be combined with wall mount, floor console or ducted fan coil units on the same multi-zone system. Mitsubishi Ceiling Cassettes can be installed in rigid drywall ceilings or in acoustical tile grid ceilings. Refrigerant piping connections, condensate drain line connections and electrical wiring connections are all concealed above the ceiling. 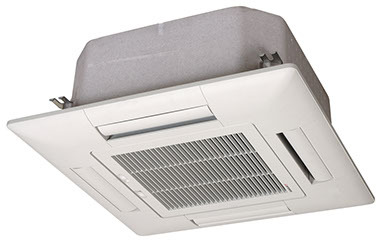 Mitsubishi ceiling cassettes can have an optional supply air duct to additionally cool a small adjacent space such as a storage closet or bathroom. The air flow pattern is adjustable for use in large rooms or narrow hallways. 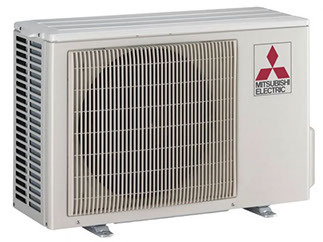 Mitsubishi systems can serve single or multiple rooms using a single outdoor condensing unit. Multi-zone systems utilize multiple indoor fan coils of various configurations and sizes from a single outdoor condensing unit. Larger fan coil units are used in larger spaces with more heat gain ; smaller indoor units are used in smaller rooms with less heat gain. They all work together connected to a single outdoor unit. The ability to control individual room temperatures using multiple thermostats allows maintaining different temperatures in different rooms. The outdoor unit ramps its capacity up and down as needed to satisfy the demands of each space served. Indoor units may be all of the same type or multiple configurations may be connected together. Mitsubishi ducted units can be installed drop ceilings and attic spaces completely concealed from view. Just like the wall mounted and ceiling mounted indoor fan coils, different sizes and capacities may be connected together. 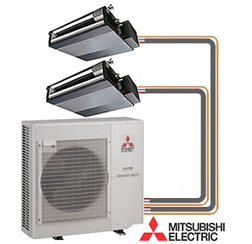 Mitsubishi Concealed Ducted Fan Coils are quiet and efficient. Some systems boast efficiency ratings higher than 20+ SEER. 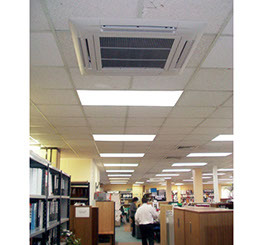 Concealed Ducted Fan Coils are low profile units designed to be used in drop ceilings without the space limitations common with other types of air handlers, furnaces and fan coils. Service access is required on each side of the unit. 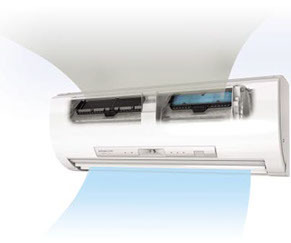 The return air can be configured to return from below or return through the rear of the cabinet.